Reading time: 4,450 words, 12 page 11 to 18 minutes. Two thousand years ago, Germanic tribesmen ambushed and annihilated three crack Roman legions thereby irrevocably altering the course of Western civilization. However, you’re not supposed to know about the consequences of this Battle of the Teutoburg Forest because it’s not politically correct. Political correctness: definition – the notion that you can pick up a turd by the clean end. There is considerable information about this battle on the internet and in texts. Some of the information is fairly accurate and some not. One can expect this from an event that occurred 2,000 years ago. After all, we’re still debating the origin of Christianity that dates from the same period. However, you will find little information on this battle’s effect on the subsequent history of Western civilization. You’ll find even less about this monumental battle’s importance to all of us today and how it continues to shape our culture, our economies and ultimately, our future. That’s why it’s helpful to know about the Battle of the Teutoburg Forest. Current events and my future articles on Islam depend on an understanding of the ancient battle and its consequences. Ann Landers once said that no one can take advantage of you without your permission. That’s accurate to a point, but it’s too glib! It assumes you have the necessary knowledge to identify manipulation. If you’re ignorant of your roots, you are by definition rootless and blowing in the wind. If you don’t know where you’re coming from, how can you navigate where you’re going? This article examines where we came from and where we’re going. This article is the first of a three-part series. A future post will cover another, little-understood mental bias called False Consensus Effect whereby we assume other people think and feel like us. Thus, with the best of intentions, we willingly open the gates to the barbarians. In the third post, we’ll discover that historians have deceived us and not for the first time. It was not the Germanic barbarians that destroyed the Roman Empire; it was the Islamic barbarians that invaded after the Germanic barbarians. However, first, we need to examine how the Germanic chieftain Arminius defeated the Romans, halted the spread of the Roman Empire and saved Western civilization in the Battle of the Teutoburg Forest. Once we see this, we can understand the effect Islam later had on the Roman Empire. Note: as a skeptic (I try to believe nothing) I ought to use secular calendar era abbreviations CE (Common Era or Current Era) and BCE (Before the Common Era). However, I’m more familiar with BC (Before Christ) and AD (Anno Domini) as are many other readers, so I’ll continue using the old methods (BC & AD) for simplicity and to avoid unnecessary mental gyrations with every date. This battle, in what is today Northwestern Germany, goes by many names such as the Varus Battle (Clades Variana) and several German variations. To call it a ‘Battle’ is somewhat of a misnomer; it would be more apt to call it an Ambush or a Massacre as I shall demonstrate. The modern day map below shows the location of the Teutoburg Forest in present-day Germany. The Teutoburg Forest (Teutoburger Wald in German) is a “rugged range of low-lying mountains covered in forests and swamps in the modern-day regions of Lower Saxony and North Rhine-Westphalia.” (39C) The mountain range was formerly called ‘Osning’ (32) and wasn’t named Teutoburg Forest until the 19th century. 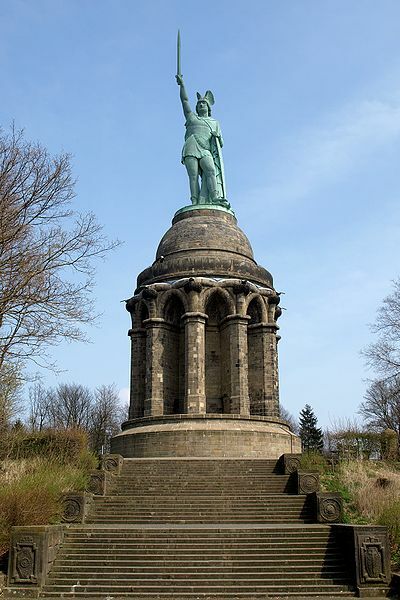 In 1875, a large statue of Arminius was erected near Detmold, Germany because it was then thought to be the site of this long-forgotten battle. However, subsequent archaeological excavations have shown the battle site was, in fact, Kalkreise. In addition to the Detmold statue, a similar Hermann Heights Monument was erected in the U.S. at New Ulm, Minnesota and another at Hermann, Missouri. As well, there have been numerous paintings, novels, plays and operas dedicated to Arminius/Hermann all which of has spineless, politically correct moderns quaking in their boots as we shall see. Cassius Dio (164-c.235) wrote that “The barbarians were adapting themselves to Roman ways … They had not, however, forgotten their ancestral habits, their native manners, their old life of independence, or the power derived from arms. And then, a rebellion broke out in the Roman province of Illyricum (today, the Balkans) and Tiberius was forced to send his eight legions there to deal with the uprising. (3) To replace Tiberius, in 7 A.D. Emperor Augustus assigned the Imperial Roman legate Publius Quinctilius Varus to consolidate the new province of Germania in 7 A.D. (51) (53) (55). Conquering it may have been a prestige project for Augustus to gain legitimacy like his predecessor, Julius Caesar, who had conquered Gaul. (37) If so, it would backfire. Creasy writes that Varus was “Accustomed to govern the depraved and debased natives of Syria, a country where courage in man, and virtue in woman, had for centuries been unknown, Varus thought that he might gratify his licentious and rapacious passions with equal impunity among the high-minded sons and pure-spirited daughters of Germany. When the general of an army sets the example of outrages of this description, he is soon faithfully imitated by his officers, and surpassed by his still more brutal soldiery.” (25) This would not be Varus’s last in a litany of mistakes and misjudgments. Arminius’ motives are obscure, and some historians believe he may have had dreams of becoming a Germanic king. (1) What is known is that he was averse to Romans’ treatment, taxation, and brutality of his people. Arminius and his father Segimer were Varus’s constant companions and often dined together. (26) Varus “accordingly became confident, and expecting no harm … refused to believe all those who suspected what was going on …” (26) This, too, would be another of Varus’s misjudgments. Having been trained by the Roman military, Arminius understood that the Germanic tribesmen were no match for the Romans’ traditional military tactics on the open ground. He needed to overcome Roman discipline, tactics, and their superior weaponry. (14) He needed to draw the legionnaires out of open fields and onto irregular ground and dense forest where they couldn’t employ their traditional military tactics. Only by adopting guerilla tactics could an unconventional force like the Germans defeat the experienced and professional Roman Legionaries. That is, until Arminius united them and led them into battle. Any description of a battle 2,000 years ago is, by necessity, conjectural. They say that the victors write the history books. In this case, history was written by the losers who happen to be literate (Romans) and not the victors (Germans) because the Germans were still illiterate at that time. It was not uncommon for Roman Emperors to have their chroniclers re-write their predecessors’ histories to make themselves look better in comparison. As well, Romans writing immediately after the ‘Varus Disaster’ had to be careful what they said to avoid jeopardizing their livelihoods or offending those still living. Being closer to the event might have given them more accuracy, but that had to be tempered with circumspection whereas later writers’ incomes and health didn’t depend on pleasing a deceased Emperor. Arminius sprang his trap in September, 9 AD when Varus and his army were on their way back to winter quarters. (41) (55) Arminius convinced Varus, to take his legions on a more northern route to supposedly quell a rebellion. There was no rebellion; it was a ruse. Even with Roman axe-men felling trees, their roadway would have been narrow so they would have been stretched out in a long, thin and very vulnerable column. The terrain became more arduous and the forest denser. The line of march stretched out perilously long. When the army reached a point northeast of Osnabruck, they were ambushed. Dio says that Arminius had asked to be excused to check on auxiliaries but instead met up with the Germans to set up the attack. This is similar to military tactics known as “defeat in detail” (34) where attacking units are strengthened by proximity to supporting units. The attackers exploit the failure of defenders to coordinate and support their units under attack as well as taking advantage of defenders’ lack of communication with their commanders. One major disagreement among historians is the duration of the battle. “Was it a long, drawn-out, three or four-day affair or was it a single furious assault?” (55) Roman historians may have stretched it out to show the Roman army in a more favorable light. Velleius Paterculus writes the battle lasted three days while Dios says four days. Despite Arminius’s strong leadership, it would be surprising if the undisciplined Germanic tribesmen could have held it together for so many days on end. In any case, the results speak for themselves. The rain soaked and loosened the sinew strings of the Roman bows rendering them useless. Their wood and hardened leather shields became waterlogged and cumbersome as well as soft and vulnerable. 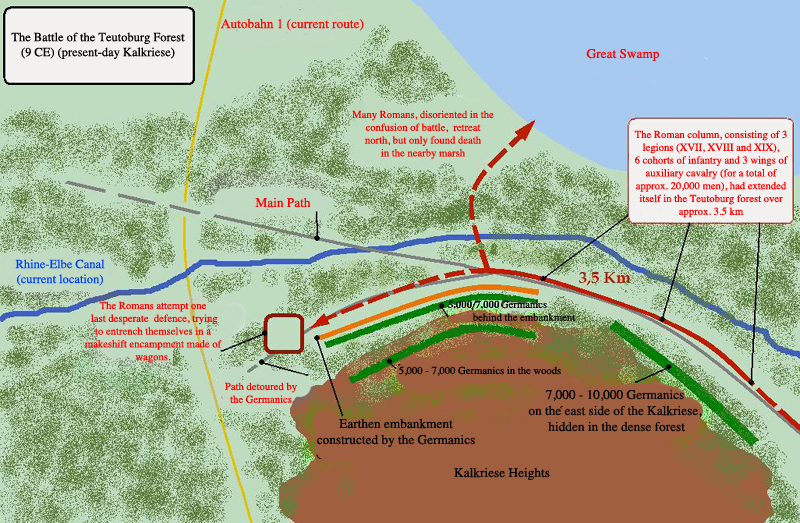 Arminius deliberately chose the season, the route and the terrain to maximize the Germans’ advantage and minimize the Romans’. From his Roman military experience, Arminius knew that the Legionnaires would be weary from a long summer of campaigning. As well, he recognized and capitalized on Varus’s incompetence as a General. Varus, “the wrong man in the wrong place” (31) making his last misjudgment took his life by falling on his sword in the prescribed Roman tradition. Ironically, his father, with the same name Sextus Quinctilius Varus, had also committed suicide (33) after the Battle of Philippi. and, according to Paterculus, so too had his Grandfather died before him. (27) “Varus, therefore, and all the more prominent officers, fearing that they should either be captured alive or be killed by their bitterest foes (for they had already been wounded), made bold to do a thing that was terrible yet unavoidable: they took their own lives.” (26) Thus Varus’s suicide left his men leaderless and destroyed what little morale and discipline they had left. It’s going to get very interesting and extremely politically incorrect. If you like what you’ve read (or not) please “Rate This” at the bottom. (21) Romans win battle of teutoburg forest: What is the result. (37) Why did the battle of Teutoburg Forest have such an impact on Roman expansion into Germany? (27) Paterculus on the Battle in the Teutoburg Forest Velleius Paterculus (c. 20 BCE – after 30 CE) Roman officer, senator, and scholar, author of a brief Roman History. 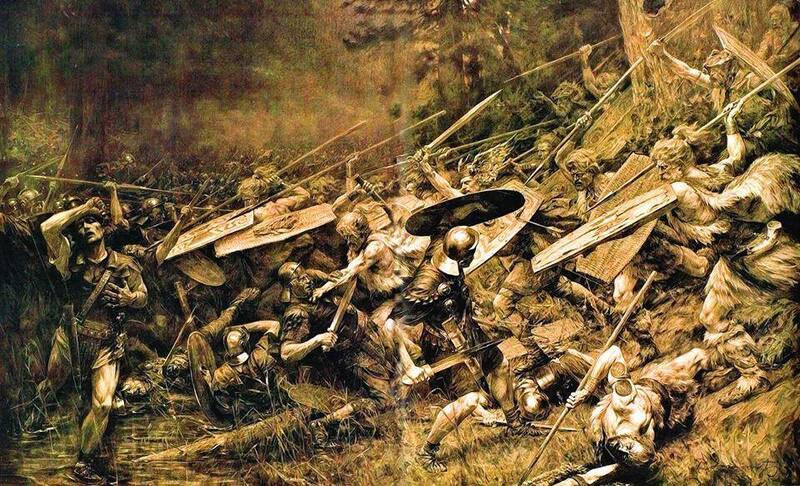 In his Roman History, the Roman officer-historian Velleius Paterculus (20 BCE – after 30 CE) has included a description of the battle in the Teutoburg Forest (September 9 CE). The author was active in the Germanic wars and knew many of the actors personally. His account is the oldest surviving description of the battle and relies on eyewitness accounts; the battlefield has been discovered at Kalkriese. (23) Readers’ comments – What prevented the Romans from conquering, or at least colonizing present-day Germany? (46) Quora reader’s comments – How did the Battle of Teutoburg Forest shape modern German history? (54) Readers’ comments – Why were the Romans unable to conquer Germania? 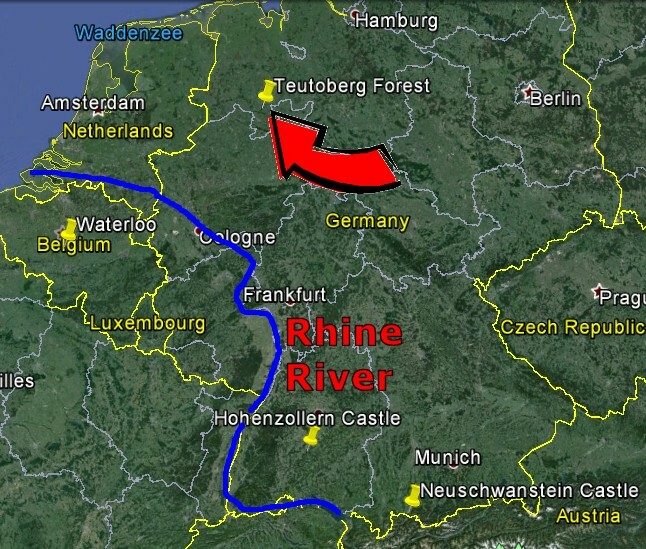 (60) Readers’ comments – Why were the Romans unable to conquer Germania? This entry was posted in News & Views and tagged 9 AD, 9 CE, Arminius, Battle of the Teutoburg Forest, Cassius Dio, Hermann, Hermann Heights Monument, Kalkreise, Missouri, political correctness, Publius Quinctilius Varus, Roman army, Teutonic tribes, Tony Clunn. Bookmark the permalink.